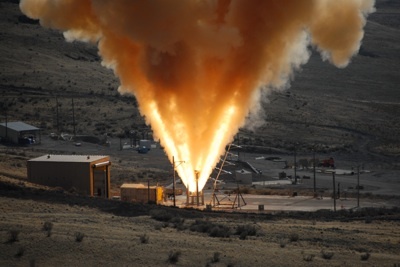 The NASA EDGE team is in Promontory, Utah at the ATK Test Facility covering the Orion Launch Abort Motor full-scale test firing. If you’ve never been to the test facility here’s what you see as you drive up to the main entrance. I actually suggested that they refer to this event as a test hiring rather than a test firing. I got nothing. 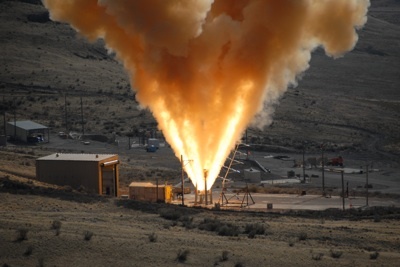 On November 20, NASA, ATK, and the Orion Project team will conduct the first full-scale test fire of the Launch Abort Motor for the Orion crew exploration vehicle. A full-scale test like this has not been conducted since the days of the Apollo Program. 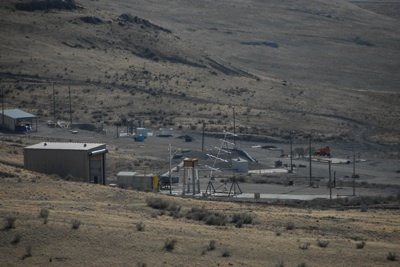 This test and earlier motor and component tests are paving the way for the Pad Abort-1 Flight Test scheduled for the spring of 2009. The Abort Motor stands over 17 feet tall, spans three feet in diameter and is equipped with a manifold that has four nozzles and turns the flow of the flames to create a pulling motion. It is the primary motor in the Orion Launch Abort System (LAS). The LAS will be able to pull the crew module to safety away from the Ares I launch vehicle in the event of an emergency on the pad or during the initial phase of ascent up to 300,000 feet. Speaking of scale, this thing is huge. It always seems smaller in the animations we use on the show. 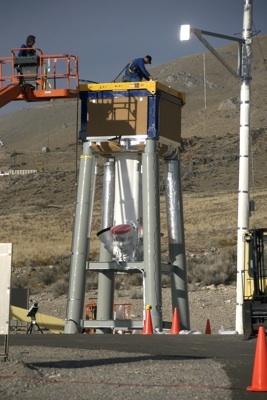 In the picture above, the Abort Motor is fitted into the vertical test stand, with the nozzles pointed skyward. The burn time for the test is five seconds. I believe the flames exiting the nozzles may reach a height of 100 feet. So we’ll see what happens during burn time. Should be fun. Today we had a chance to view the dry test run from the control room. The dry run took about 45 minutes and involved a series of checks before a they ignited a small charge. Import Dry Run Note: Remember not to drink a 64 oz. cafe latte before the test. The script doesn’t call for bathroom breaks. The team from ATK did a great job and I think everyone is ready for the test on Nov. 20. Our coverage of the Abort Motor test is part of a NASA EDGE vodast we are doing on the Orion Launch Abort System. Today we had a chance to conduct a few interviews for the vodcast. WHAT!?!?!?! Ron is a set therapist for ATK too! Heather Angel is a propulsion engineer for Lockheed Martin. She’s been with the company for a little over six months and has done an outstanding during her short tenure. We expect big things from her in the years to come. Did you notice the gradual increase in height from left to right? For the record, we were on a slant. We can’t produce a LAS vodcast without interviewing the head honcho for LAS, Barry Meredith. Barry currently works at NASA Langley Research Center and has been with NASA for 40 years. He works in the same directorate as me at Langley. I can’t say enough about Barry. He’s a straight shooter who knows how to get the job done. Unfortunately Barry is leaving us in December and is retiring from NASA. I am definitely looking forward to his retirement party. And for his final act before retirement, Berry Meredith names Blair Allen as the nations top Medianaut with an emphasis in Magnetospherence! If that doesn’t work, I can always emcee his retirement party. I just bought a new karaoke machine. Anyway enough rambling for one day. Hey, the test firing is right around the corner and I think Ron is setting up the cameras. We’ll be back to give you our take on the test firing and see if Blair’s hotdogs survived the burn. What a day at ATK! 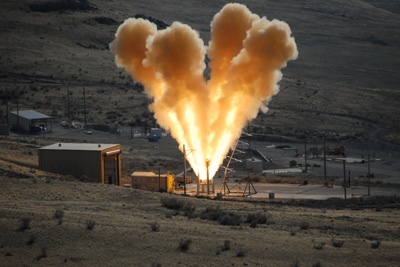 NASA, Lockheed Martin, Orbital Sciences Corporation, and ATK successfully performed a ground firing test of the abort motor for NASA’s Orion crew exploration vehicle Launch Abort System. The abort motor fired for five seconds with the exhaust plume flames reaching an estimated 100-130 ft. It was a sight to see. Check out the first six frames of 15+ pics we took of the firing test using our Nikon D200 camera. 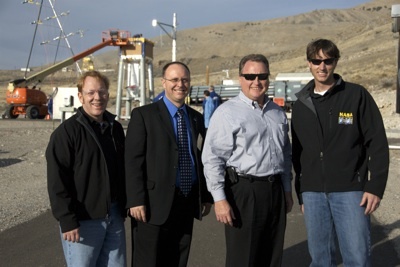 Congratulations to the entire Launch Abort System team on a job well done! On to Pad Abort-1 at White Sands in 2009. 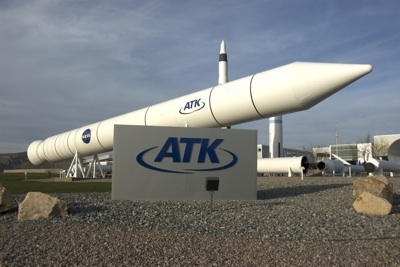 NASA EDGE would like to give special thanks to the following cool ATK employees: Trina Patterson, Julie Lucus-Keller, Justin Ellingford, Trevor Brasfield, and Jennie Campbell. Special thanks to Julie and Justin for helping us out with gear, work space, and everything else. They are a great group of people to work with. Signing off from ATK. P.S. We also wants to thank all of the NASA EDGE fans at ATK for making us feel so welcome. It was great to meet everyone. Hopefully, we will be back for more tests in the future. 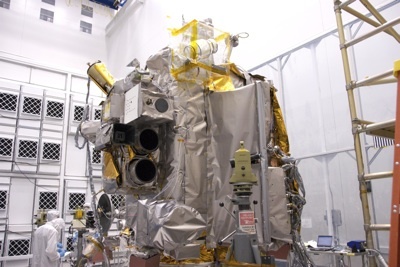 Author nasaedgePosted on November 21, 2008 March 19, 2013 Tags General18 Comments on Successful Test!! 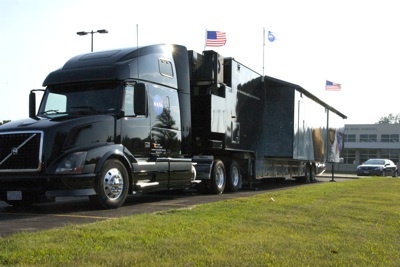 The NASA EDGE team had the opportunity to visit Ames, Iowa to assist the staff that work the NASA Exploration Experience trailer. Ames was the last stop in the Iowa State tour. The trailer also visited West Point for the 56th annual Iowa Sweet Corn Festival and the Iowa Children’s Museum in Coralville. 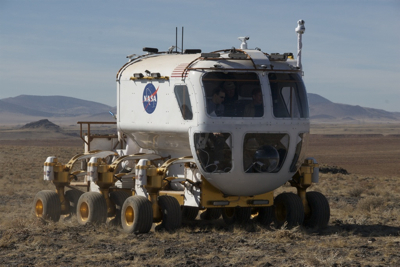 Approximately 5,400 people took the opportunity to go inside the trailer to learn about NASA’s plan to return humans to the moon. 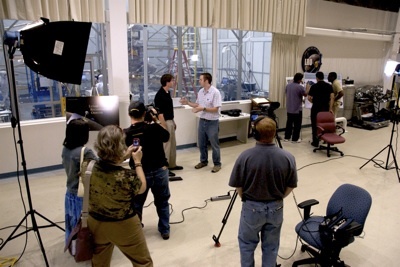 You can learn more about the Exploration Systems Mission Directorate’s Communications and Exhibits at https://www.nasa.gov/directorates/esmd/outreach/index.html. While visiting Ames High School, the team had the privilege of interviewing the winner of the 2nd Annual 21st Century Explorer Podcast Competition (vodcast, 15-18 age group), Kristina J. The podcast competition was sponsored by Lockheed Martin and AIAA in collaboration with NASA. Kristina had to answer the question, “What do you think is NASA’s Greatest Exploration achievement in the past 50 years and why?” Her vodcast titled, “Hello From the Children of Planet Earth”, discussing the important discoveries made by the Voyager spacecrafts. Kristina has a very bright future ahead of her. Entering her junior year, she wants to be an aerospace engineer and work for NASA (good news!). She also has a lot of experience with film and production. We were able to witness first hand her shooting abilities at the trailer. 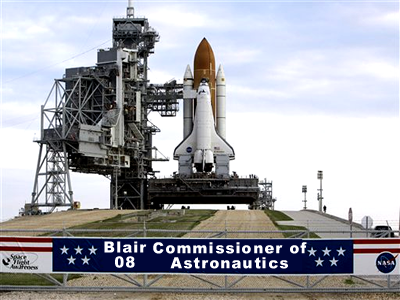 In fact, if Blair ever makes it as a medianaut and flys to the moon, then we have the perfect fill in as co-host. 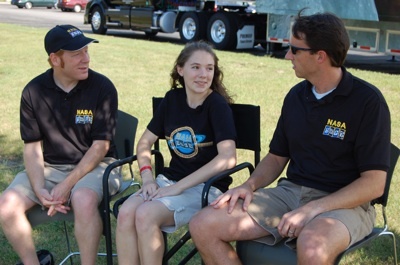 You can see her interview on the next NASA EDGE vodcast slated to be released on Sept. 16. Here are a couple of more pics we have to throw in. 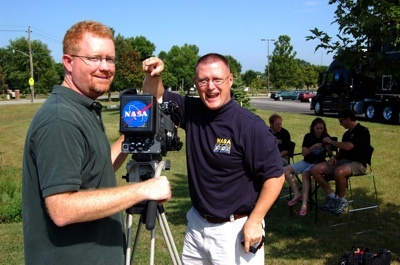 James Bilbrey (NASA MSFC) was tasked to shoot video for the NASA Exploration Experience, however, he actually helped us out with our shoot. Kudos to James and Mick Speer for helping us out with audio. 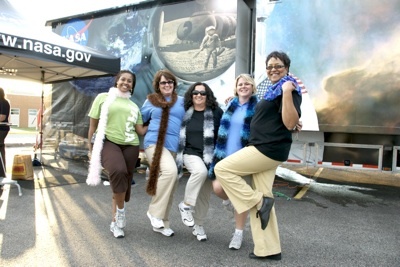 Okay, here is one last picture – the women of NASA MSFC. What a great group of people to work with! After a long day in the hot sun they still had enough energy to smile for the camera. Bonus points if you can name any one of them. 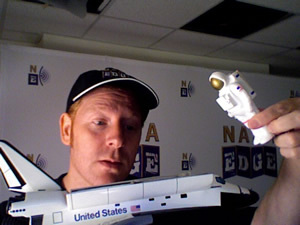 Don’t forget our next vodcast comes out on September 16 – NASA EDGE: Folklife Festival. Blair had a problem with a power converter on his T-34 heading to Tashi Station, and Mos Nocohost was the nearest place that sold power converters. As we approached Black Point Lava Flow, we happened to see a bunch of tents in the distance. Using stealth like techniques, we decided to investigate. Avoiding all imperial entanglements, we managed to get some cool pics of a very cool looking small pressurized rover concept. NASA is now testing a new generation of rovers that will be used when we return to the moon by the end of the next decade. 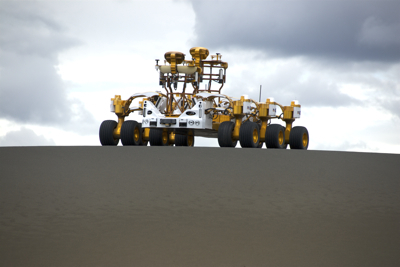 One of these rover concepts is the Small Pressurized Rover or SPR. The SPR consists of a Mobility Chassis and an SPR cabin module. 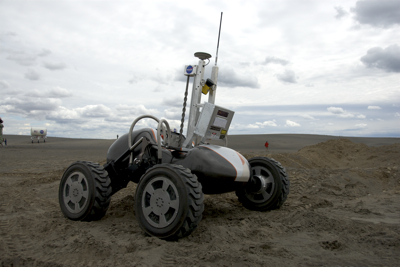 The SPR concept offers many advantages over the rovers of the Apollo days. 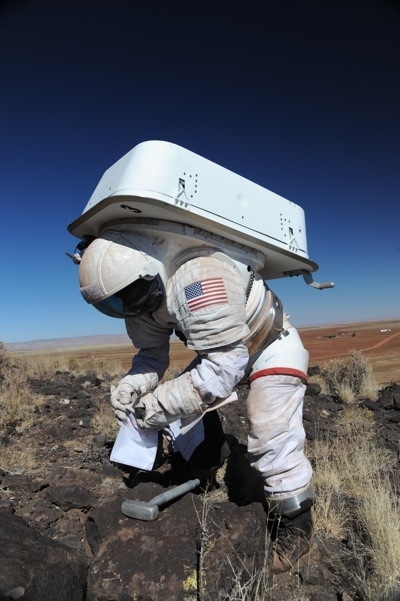 It will increase the potential range of exploration, provide protection for the astronauts, reduce the amount of time astronauts must wear pressurized suits and allow for more scientific research. Another unique advantage of the SPR system is the crew lock concept, providing a rapid EVA ingress/egress. The crew lock will allow the crew to enter and exit the EVA suit while never having to bring the suit inside, keeping the internal space mostly free of dust. Well, the second power converter died on the T-34 and we were stuck out on the lava flow with no transport to get to Mos Nocohost. As the Sun drifted away below the horizon and temperatures falling near freezing, I asked Blair if we had a back up plan. “Back up plan?” responded Blair. Have no fear, SPR is here. The SPR team is a great group of engineers and technicians. 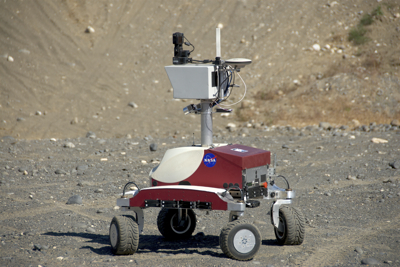 They definitely have the “right stuff” and have been working hard the past couple of years on lunar rover concepts. In fact, they managed to find time to bail us out and provide a lift into town. 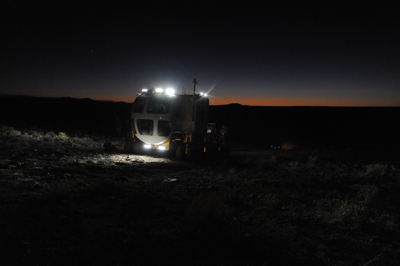 We had a great time covering the SPR test at Black Point Lava Flow in Arizona. 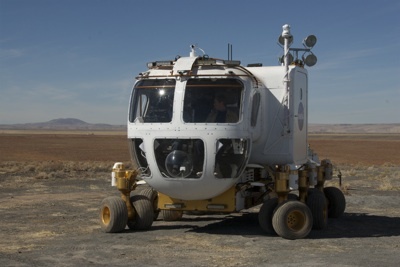 Look for an NE@ segment in the next month or so featuring Astronaut Mike Gernhardt taking us on a test drive in the SPR. What&apos;s up at Langley in Exploration? We are very fortunate to be part of the Constellation Program. It’s been four years since President Bush announced the plans to return humans back to the moon and then on to Mars and beyond. The cool part about our jobs (besides looking for a new co-host) is that we get to see some awesome hardware. Check out two of the many projects going on at Langley to support Constellation. 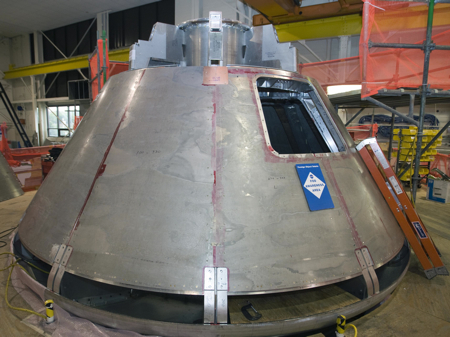 Fabrication of the Pathfinder crew module, one of NASA Langley’s current space hardware projects, is nearing completion. Upon completion, Langley will transport the Pathfinder crew module to the White Sands Missile Range in New Mexico where it will be used in preparations for Pad Abort-1, the first unmanned test of Orion’s launch abort system. Rumor has it, the co-host may travel on this pathfinder just like he did in the Orion Flight Test Article (See NE@Orion FTA for more details on the FTA). HDTV is optional on the trip. 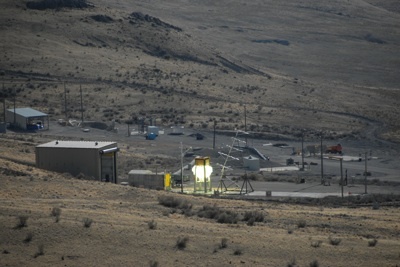 Here’s a small-scale mockup of the launch abort vehicle used in recent testing in Langley’s 14×22 subsonic wind tunnel. The launch abort vehicle includes NASA’s new spacecraft Orion and the launch abort system, which will provide a safe escape for the crew in an emergency on the launch pad. 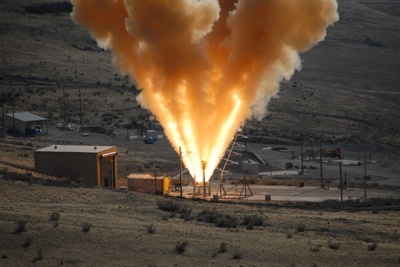 During this test, researchers investigated the interaction and effects of the launch abort system’s jettison motor plume during the separation of the abort system and the crew module. The plume of the rocket motor was simulated with high-pressure air. 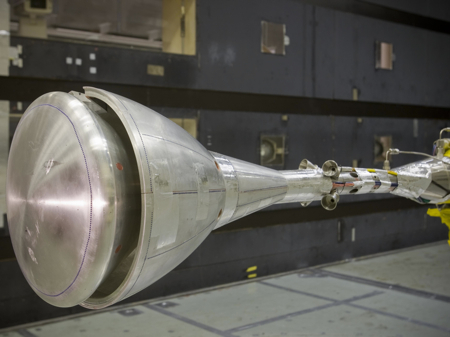 The jettison motor, one of three solid propellant motors in the launch abort system, is designed to separate the spacecraft’s abort system from the Orion crew module during launch. Unfornuately the co-host could not participate as a crew member in this test. Even though he barely fit in the crew module, Blair had a tough time closing the hatch. You can’t win them all. 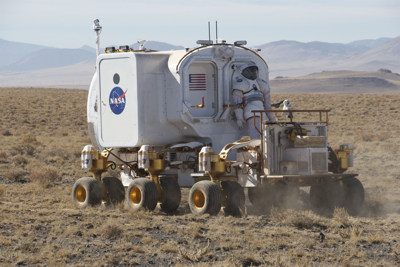 These are just two of many many projects going on at NASA Field centers across the country. We can’t wait to head out to White Sands to cover Pad Abort-1 and down to KSC to cover Ares 1-X. On a side note – Congratulations to SpaceX! 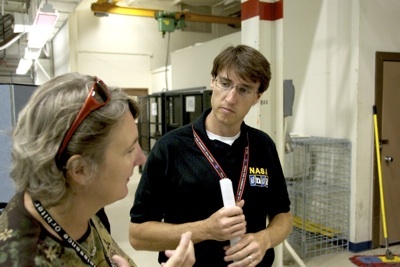 Author nasaedgePosted on October 3, 2008 March 19, 2013 Tags General4 Comments on What&apos;s up at Langley in Exploration? 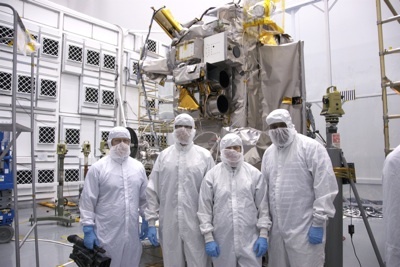 Last week the NASA EDGE team traveled to NASA Goddard Space Flight Center in Greenbelt, MD to shoot a segment on the Lunar Reconnaissance Orbiter (LRO). LRO is the first mission in the US Space Exploration Policy, a plan to return to the moon and then to Mars and beyond. You can learn more about LRO at www.nasa.gov/LRO. Special thanks goes to Stephanie Stockman, Education and Public Outreach Lead for the mission. She handled all the logistics from her end and made our life very easy during the shoot. Below are a couple of pics from the shoot. 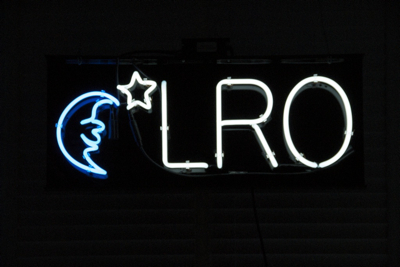 Finally, here’s a pic for the LRO team. We found this in their conference room. We need to look into getting one for NASA EDGE. We look forward to now producing a segment on LCROSS because LRO and LCROSS are going up on the same spacecraft. I guess we are off to Ames in the near future. Thanks again to the LRO team for a great time up at NASA Goddard! I need your assistance. During the Daytona Vodcast, I was asked to name the model sitting in front of me on the set (see picture below.) I answered confidently, “The Space Shuttle.” My colleagues immediately corrected me. It is, in fact, the Orbiter. The whole thing felt more like being asked our nation’s colors, answering red, white and blue, and being told that I am wrong. Our colors in fact are scarlet red, cloud white, and navy blue. So, like a good outsider, I did some research. It looks like NASA refers to the Orbiter as the Space Shuttle on occasion (see links below.) In fact, they seem to use the terms interchangeably. I presented this reality to Chris and Franklin on our most recent Vodcast. It was not good enough for them. They want your input on this matter. So, please examine the evidence below and ask yourself the following question. If NASA uses the terms Space Shuttle and Orbiter interchangeably, is it fair to castigate the Co-Host for doing the same thing? in the landing section at the bottom of the page, “Learn where all the best vantage points for viewing shuttle launched in Brevard County, Fla. And get tips for viewing a shuttle landing. Here again, the Discovery is referred to as the Shuttle when discussing landing. Earlier in this post, it is mentions specifically as the Orbiter. Again, the use seems to be interchangeable. Again, the use seems to be interchangeable. I am not listing any sources here. The overwhelming evidence for my case is on the outside. Have you ever heard the regular news agencies refer to an “Orbiter Docking” or an “Orbiter Landing?” I haven’t either. 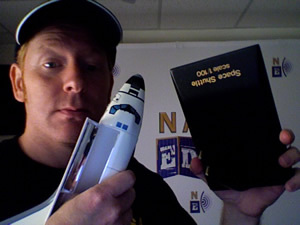 So, let me know if it is reasonable for me to follow NASA’s example or go with Chris and Franklin. My fate is in your hands. The following proposal was offered officially during our most recent Vodcast, NASA EDGE: Daytona 500. I am posting it here in order to officially begin my campaign. 1. Institute an annual Astronaut Draft (similar to professional sports drafts) wherein each directorate or division would receive a predetermined number of draft picks to fulfill their missions each year. The draft would not be limited to rookie selections. Veteran Astronauts would be eligible in the first year, but directorates could hold onto their best astronauts just like keeper leagues. 2. Create a series of Astronaut Scouting Combines to help the various directorates/divisions gauge the skills within the NASA Astronaut talent pool. These combines would be occur prior to the draft at key training facilities such as the NBL, Desert RATS, M113 Obstacle Course, etc. 3. Merge the Mission schedule with a solid Playoff Model. This is the most difficult, so I am willing to look at more of a merge between the Mission schedule and the bowl game system. Each Directorate, based on performance, would receive a mission bid, just like bowls. Those missions are then sponsored by commercial entities. For example, the Lens Crafter Hubble Mission, or the Home Depot ISS Servicing Mission are possible. 4. Developing a marketing manifesto to manage the huge amount of Public Relations opportunities. Fantasy NASA. Mission Play-by-play and color commentary, where you actually have the missions called by a team of broadcasters – live. Another idea, again from professional sports, might include a live concert at NASA Kennedy Space Center for the fans just prior to launch. I know that these ideas are radical, but I think I am on to something big. Can I count on your support? Back from Tashi Station….more pics! I hope Blair finds his way back from Tashi. We noticed a few stormtroopers following him into an alley. In the meantime here are some more pics from Tatooine or Moses Lake. Someone needs to photoshop this pic with a space backdrop and Earth in the background. We forgot to mention the Desert RATS in our first post. Joe Kosmo and Barbara Romig, pictured in the orange jumpsuits to the left, lead the Desert RATS. They are top notch professionals with a great sense of humor. You’ll see them again in our NE@ segment at Moses Lake. This actually looks like a hot wheels car. They demostrated Scarab’s manueverability around a small crater. I guess you can call this the R2-D2 of the lunar rover concepts. 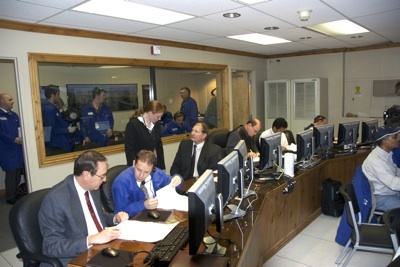 These rovers were being tele-operated from NASA Johnson Space Center. 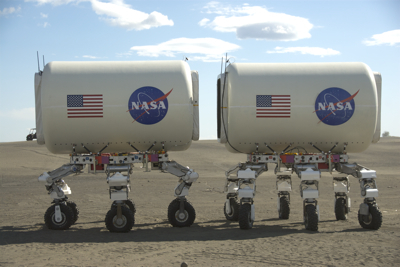 Two ATHLETES, each carrying a mock lunar hab, joined together to simulate the connection of two hab modules. The ATHLETEs in the picture above are only 1/4 scale versions. 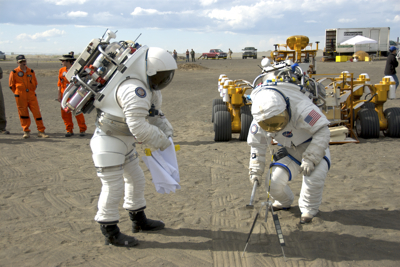 Imagine having an ATHLETE four times the size working on the lunar surface….very cool! Thank you for all the cool comments from the previous post. We had a great time in Moses Lake, WA. The people are very friendly and hopefully we can go back in the future. Wait a minute…somone just came out of hyperspace. I better sign off before I get hit. All the best, Chris (Host). Author nasaedgePosted on June 15, 2008 March 19, 2013 Tags General28 Comments on Back from Tashi Station….more pics!